Kris is primarily responsible for client relations and day-to-day operations. 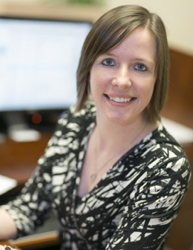 She brings a strong set of organization and problem solving skills to our firm. Prior to joining Beacon Pointe, Kris worked for Ironmark Advisors. Before Ironmark Advisors, Kris spent five years at TD Ameritrade Institutional as a Relationship Manager after beginning her career at Washington Mutual. She enjoys spending her free time taking photos and scrapbooking, and traveling with her husband.